Pathogenesis of IPF: new concepts – is inflammation relevant? Treatment of idiopathic pulmonary fibrosis patients has evolved very slowly; the fundamental approach of corticosteroids alone or in combination with other immunosuppressive agents has had little impact on long-term survival. The continued use of corticosteroids is justified because of the lack of a more effective alternative. Current research indicates that the mechanisms driving idiopathic pulmonary fibrosis reflect abnormal, dysregulated wound healing within the lung, involving increased activity and possibly exaggerated responses by a spectrum of profibrogenic growth factors. An understanding of the roles of these growth factors, and the way in which they modulate events at cellular level, could lead to more targeted therapeutic strategies, improving patients' quality of life and survival. Idiopathic pulmonary fibrosis (IPF) is clinically a restrictive lung disease that characteristically progresses relentlessly to death from respiratory failure. Median survival of newly diagnosed patients with IPF is about 3 years, similar to that of clinical stage 1b non-small cell lung cancer. The quality of life for IPF patients is also poor. Despite this, there has been remarkably little progress in development and/or assessment of therapeutic strategies for IPF. High dose corticosteriods alone or in combination with other immunosuppressive agents continue to be prescribed, although there is no clinical evidence of their efficacy . Recent data indicate that, following such treatment, less than 30% of IPF patients show objective evidence of improvement, including better survival, while there is a high incidence of drug-related adverse effects. Furthermore, it remains unclear whether a positive response can be attributed to the treatment itself or to the patients having a less aggressive form of the disease [2,3]. For significant improvements to occur in the survival of patients with IPF, there needs to be development of novel and more precisely targeted therapies. Selection of future appropriate regimes must be critically dependent on improved characterisation of the molecular pathways driving pathogenesis of IPF . The focus of research efforts in a number of laboratories, including our own, has thus been directed towards establishing the relative roles of molecules that may determine the outcome of associated profibrogenic processes. Accordingly, such efforts could lead to potential candidate molecules being exploited for therapeutic manipulation. Support for this strategy is echoed in the recent consensus statement issued jointly by the American Thoracic Society and the European Respiratory Society, in which the roles of "various cytokines and growth factors" are described as "critical" to the process of fibrosis . Individual growth factors involved in the development of pulmonary fibrosis invariably regulate other cell functions, as well as cell proliferation. They may originate from a variety of sources including immune cells, endothelial cells, epithelial cells, fibroblasts, platelets and smooth muscle cells. However, in the context of IPF pathogenesis, it is now suggested that IPF is an 'epithelial-fibroblastic disease' (see Pathogenesis of IPF: new concepts – is inflammation relevant?). It is therefore the interactions of growth factors with these epithelial and fibroblast cell types that are most critical in determining whether the ultimate outcome of wound-healing responses to lung injury is IPF. Growth factors have predominantly been described in fibroblasts, which are recognised key players in wound healing. It is becoming increasingly apparent, however, that 'injured' and 'activated' alveolar epithelial cells (AECs) both secrete and respond to growth factors themselves, particularly in IPF, thereby contributing to the outcome of the profibrogenic processes. Functions regulated in fibroblasts that directly influence fibrogenesis include enhancing or inhibiting extracellular matrix (ECM) protein synthesis, chemotaxis, production of metalloproteinases and their inhibitors, expression of adhesion molecules, and angiogenesis. Much less is known about how growth factors regulate AEC function to modulate fibrogenesis but, in AECs obtained from IPF patients, growth factors are potentially responsible for secretion of metalloproteinases and, paradoxically, inhibit proliferation through enhancement of apoptosis. It also seems probable from familial studies that there is a genetic predisposition to development of IPF . Although the nature of any genetic component is at present unknown, polymorphic genes for a number of fibrogenic growth factors have been found [6,7,8]. Cellular phenotype may thus be an important determinant of growth factor response and, hence, of increased susceptibility to development of IPF. This review focuses on those growth factors for which there is compelling data for their involvement in the molecular pathways controlling fibrogenesis. Within the constraints of this forum, it will not be possible to fully consider all aspects of this involvement. Intentionally, we will update, rather than simply repeat, what is already widely known regarding these mediators. We specifically highlight new important findings, with implications for novel targeted therapeutic approaches in IPF. Recent developments strongly challenge the current concept of IPF pathogenesis. The widely held view has been that the distinct histopathological subsets of IPF (usual interstitial pneumonia [UIP], desquamative interstitial pneumonia, non-specific interstitial pneumonia, and acute interstitial pneumonia) share common pathogenetic features, regardless of the initiating agent (where known). A hypothesis of persistent interstitial inflammation leading to, and modulating development of, fibrosis has therefore developed. Underpinning this hypothesis are many studies that have highlighted the critical importance, in determining the outcome of pathogenic events, of polypeptide mediators released both from resident and immune cells. Indeed, this paradigm appears to be sustained in a number of potentially fibrotic lung diseases that have a prominent inflammatory process during their early stages and that exhibit a favourable response to steroid-based anti-inflammatory therapies, particularly if therapy begins during the inflammatory phase (e.g. desquamative interstitial pneumonia, non-specific interstitial pneumonia, hypersensitivity pneumonitis, and sarcoidosis). Recent investigations, however, have shown that consideration of the constituent histological patterns of IPF as separate pathological entities correlates much better with clinical outcome, those with UIP tending to have the worst prognosis. Anti-inflammatory therapies, even in combination with potent immunosuppressives, fail to improve the disease outcome. Such a distinction in clinical course has led to a redefinition of IPF diagnostic criteria by the American Thoracic Society and the European Respiratory Society, and a requirement for the histopathological presence of UIP . Furthermore, there is very little evidence to support the presence of any prominent inflammation in the early stages of UIP. In fact, inflammation appears not to be required for the development of the fibrotic response [9,10], which may account for the observed therapeutic failures. The documented inflammation found in UIP is usually mild, and is associated with areas of ongoing fibrosis rather than prefibrotic alveolar septa . Selman et al. have advanced a new hypothesis in which they propose that UIP (IPF) represents a model of abnormal wound healing (Fig. 1), resulting from multiple, microscopic sites of ongoing AEC injury and activation, with release of fibrogenic mediators. These mediators lead to areas of fibroblast-myofibroblast foci (sites of injury and abnormal repair characterised by fibroblast-myofibroblast migration and proliferation), to decreased myofibroblast apoptosis, and to enhanced release of, and response to, fibrogenic growth factors. These foci evolve and coalesce into more widespread fibrosis. Abnormal wound-healing model of idiopathic pulmonary fibrosis pathogenesis. In the model proposed by Selman et al. , microinjuries damage the epithelium and cause the release of profibrogenic growth factors and the development of an antifibrinolytic microenvironment that promotes wound clot formation. Proliferating and differentiating fibroblasts migrate through a disrupted basement membrane, secreting extracellular matrix (ECM) proteins and angiogenic factors. An imbalance in matrix-degrading and matrix-enhancing enzymes favours increased deposition of ECM. Myofibroblasts are not removed and they release growth factors that promote epithelial cell apoptosis. Associated with abnormal repair are aberrant processes of re-epithelialisation and ECM remodelling, leading to basement membrane disruption, angiogenesis, and fibrosis. Following injury, rapid re-epithelialisation is essential to restoration of barrier integrity and requires epithelial cell migration, proliferation and differentiation of type II AECs into type I AECs. In IPF, the ability of type II AECs to carry out this migration, proliferation and differentiation appears seriously compromised . A number of profibrogenic mediators seem to be implicated in this deficiency. Impairment of this normal wound-healing response could occur through the observed excessive loss of AECs by apoptosis that seems to be a feature of IPF. In parallel, proliferating fibroblasts emerging during the normal repair process are able to self-regulate their production of matrix synthesis and degradation components and mitogens, through autocrine mechanisms that, in established fibrosis, may be dysregulated in increased numbers of cells displaying an altered profibrotic myofibroblast-like phenotype. It is now readily apparent that the injured epithelium in IPF, in close proximity to the interstitial fibroblasts, elaborates a number of key growth factors. This not only allows for autocrine control of epithelial cell growth and differentiation, but also enables paracrine control of fibroblast proliferation, chemotaxis and ECM deposition to occur. The expression of several key fibrogenic growth factors has been highlighted and can be localised predominantly to hyperplastic type II AECs. The consequences of tumour necrosis factor-alpha (TNF-α) overexpression or deficiency have been explored in animal models of fibrosis. For example, mice overexpressing TNF-α develop IPF-like fibrosis, whereas TNF-α-deficient or double TNF-α receptor knockout mice show resistance to bleomycin-induced fibrosis (for a review, see ). Furthermore, a TNF-α promoter polymorphism seems to confer increased risk of developing IPF . It has been shown that type II AECs are a primary source of TNF-α in the lung . In human IPF, compared with cells from normal lungs, TNF-α immunoreactivity is increased in hyperplastic TNF-α type II AECs . In the context of the proposed abnormal wound-healing model of IPF, TNF-α release from damaged AECs could thus exert profound profibrotic effects. TNF-α may increase fibroblast proliferation, differentiation and collagen transcription indirectly via transforming growth factor-beta (TGF-β) or platelet-derived growth factor (PDGF) induction pathways . Furthermore, TNF-α activity promotes induction of matrix-degrading gelatinases that can enhance basement membrane disruption and can facilitate fibroblast migration (for a review, see ). Finally, promising results have been obtained by treating IPF patients with pirfenidone, a novel antifibrotic agent with anti-TNF-α properties . Many studies have shown that PDGF is a potent fibroblast mitogen and chemoattractant. There is in vitro evidence suggesting that a number of fibrogenic mediators including TNF-α, TGF-β, IL-1, basic fibroblast growth factor and thrombin may exhibit PDGF-dependent profibrotic activities (for a review, see ). PDGF comprises two polypeptide chains, A and B, and is active as either of the homodimers or as a heterodimer. Activation of α and β PDGF-receptor (PDGF-R) subunits, which have different affinities for the A and B isoforms, occurs with their dimerisation. In normal adult lung, PDGF and PDGF-R are expressed at low levels in alveolar macrophages, but they are upregulated in IPF. Additionally, in early-stage but not late-stage IPF, type II AECs and mesothelial cells express PDGF and PDGF-R. In particular, the type II AECs in early-stage IPF strongly expressed mRNA for PDGF-B and PDGF-Rβ . Expression of PDGF-B from an adenoviral vector or administration of recombinant human PDGF-BB, delivered intratracheally into rat lungs, produces histopathologic features of fibrosis , further supporting a role for PDGF in IPF fibrogenesis. Moreover, suppression of PDGF peptide synthesis by the antifibrotic agent pirfenidone is associated with inhibition of bleomycin-induced pulmonary fibrosis in the hamster . Whether PDGF is essential for development of fibrosis, however, will only be known following experiments with recently developed PDGF-R knockout chimeras (for a review, see ). The TGF-β family of peptides has similar biological functions and binds to the same receptors. It is only TGF-β1, however, that is consistently found to be upregulated at sites of fibrogenesis. TGF-β1 is a fibroblast chemoattractant and is able to exert a bimodal effect on fibroblast proliferation, via an autocrine PDGF-dependent pathway. Moreover, it is also the most potent stimulator of fibroblast collagen production yet described. This enhanced collagen deposition is mediated through increased mRNA transcription and stability, through decreased degradation of procollagen via inhibition of collagenase production, and through increased production of matrix metalloproteinase inhibitors (including tissue inhibitor of metalloproteinase, plasminogen activator inhibitor and α-macroglobulin; for a review, see ). Immunohistochemical studies in patients with IPF reveal enhanced expression of TGF-β1 in a number of cell types. In early disease with minimal fibrosis, this was found primarily in alveolar macrophages. In advanced honeycomb fibrotic lesions typical of a UIP phenotype, however, TGF-β1 overexpression was localised in hyperplastic type II AECs . A large number of studies with animal models of pulmonary fibrosis have confirmed the fibrogenic nature of TGF-β1 overexpression and have demonstrated the antifibrotic effects of TGF-β1 inhibition, such as with anti-TGF-β1 antibodies (for a review, see ). Furthermore, a polymorphism at position +915 in the signal sequence of the TGF-β1 gene confers an amino acid change with effects on TGF-β1 production. The 'high-producer' allele is associated with allograft fibrosis and pre-transplant fibrotic pathology in patients requiring lung transplant . Unfortunately, however, the pluripotent nature of TGF-β1 activity in the lung has prevented the use of such specific anti-TGF-β1-directed therapies. Therapeutic efforts are now focusing on modulators of TGF-β1 activity such as pirfenidone, which inhibits TGF-β1 gene expression in vivo, inhibits TGF-β1-mediated collagen synthesis and fibroblast mitogenesis in vitro, and appears to slow progression of IPF when administered to patients . Insulin-like growth factor-1 (IGF-1) stimulates proliferation of a variety of mesenchymal cell types, including fibroblasts where it may act synergistically with other fibrogenic growth factors, and is also a potent inducer of collagen synthesis. IGF-1 regulation is complex, with alternative mRNA splicing leading to the expression of a number of IGF-1 variants and post-translational control of IGF-1 activity by at least six high-affinity insulin-like growth factor-binding proteins (IGFBPs). IGF-1 activity was first identified in alveolar macrophages (AM)from IPF patients. Paradoxically, however, recent data from our laboratories show total IGF-1 expression actually decreases in unfractionated bronchoalveolar lavage cells (BALC) from IPF patients, compared with normal controls . This correlates with findings of high levels of IGF-1 and IGF-1 receptor expression only in early-stage IPF with minimal fibrosis, localised to a number of cell types including AM, and prominantly in type II AECs. In late-stage IPF or normal controls, only AM continued to express these molecules . These data point towards the importance of IGF-1 expression in the initiation of IPF. Furthermore, primary human airway epithelial cells produce IGF-1 in vitro, and the IGF-1 component of their conditioned media accounts for most of the mitogenic activity of the conditioned media for lung fibroblasts . IGF-1 activity is regulated by the presence of IGFBPs, able to both stimulate and inhibit IGF-1-mediated actions and to exert IGF-independent effects themselves. IGFBP-3 and IGFBP-2 levels are increased in IPF bronchoalveolar lavage fluid [22,23] and in type II AECs exposed to oxidant injury. Furthermore, in type II AECs, these increases are associated with induction of apoptosis and show distinct patterns of distribution, with IGFBP-3 most abundant in the extracellular compartment and IGFBP-2 mainly intracellular, but with significant nuclear localisation . In primary human lung fibroblasts, data from our laboratories show potent induction of IGFBP-3 by fibrogenic TGF-β1 . Taken together these findings support IGF-independent functions for IGFBP-3 and IGFBP-2 in fibrogenesis, putatively involving transcriptional activation of growth-regulating genes and regulation of apoptosis. Human fibroblasts demonstrate enhanced proliferation and collagen synthesis, with a simultaneous downregulation of IFN-γ transcription, in response to IL-4 . This loss of antifibrotic activity of IFN-γ may promote a pro-fibrotic mediator imbalance and favour selection of a type 2 immune response. Indeed, evidence shows that IPF patients have a predominantly type 2 (T-cell helper [Th]2-like mediator) immune response. Furthermore, patients having drug-responsive forms of interstitial lung disease (sarcoid and extrinsic allergic alveolitis) demonstrate upregulation of both IFN-γ and IL-4 expression on type II AECs, whereas IPF patients fail to express IFN-γ , perhaps because of a predisposing IFN-γ microsatellite polymorphism . Simultaneous promotion of a Th2 (IL-4-led) response and suppression of the Th1 (IFN-γ-led) response could thus promote fibrogenesis through enhanced and unchecked IL-4 (Th2) expression. Endothelin-1 (ET-1) is a peptide of diverse function implicated in the development of a number of diseases, including IPF, where it may promote fibroblast and AEC proliferation, fibroblast differentiation into myofibroblasts, chemotaxis, contraction, and collagen synthesis while inhibiting collagen degradation. ET-1 is able to induce a number of fibrogenic growth factors through paracrine stimulation of different cell types, including TNF-α, TGF-β and fibronectin, and may enhance neovascularisation through induction of vascular endothelial growth factor (VEGF) (for a review, see ). ET-1 is converted from an inactive form, big endothelin, to mature endothelin by endothelin-converting enzyme-1 (ECE-1). In IPF lungs, big endothelin, ECE-1 and ET-1 expression is enhanced and co-localised, particularly in airway epithelial cells and type II AECs, and correlates with disease activity . ET-1 effects are mediated through ET-A and ET-B receptors, and ET-1 receptor antagonists such as bosentan, which blocks both receptors, have been used with partial success to inhibit fibrosis in a rat model of bleomycin-induced pulmonary fibrosis . Connective tissue growth factor (CTGF) is an immediate-early gene (ccn2) product, a member of the structurally related CCN family of proteins. CCN members exhibit a wide range of functions but, in general, are secreted proteins associated with the ECM that regulate biological processes such as adhesion, angiogenesis and fibrosis. CTGF is a potent enhancer of fibroblast proliferation, chemotaxis and ECM deposition. In mesenchymal cell types, CTGF induction is primarily but not exclusively mediated by TGF-β, through a TGF-β-response element in the CTGF promoter (for a review, see ). There has thus been considerable interest in CTGF as a downstream mediator of TGF-β actions, not least because CTGF may account for many of the profibrogenic activities attributed to TGF-β and may be a more suitable target for antifibrotic therapies. Many recent studies have shown increased expression of CTGF to be associated with fibroproliferative disorders, and we recently reported this in IPF . There appear to be multiple cellular sources of CTGF in the lung, including fibroblasts and bronchial epithelial cells. Downregulation of CTGF expression seems to offer protection from fibrosis. A preliminary trial of IFN-γ co-therapy in IPF patients led to clinical improvement, associated with inhibition of CTGF gene expression . Overexpression of TGF-β1 in mice by delivery of a TGF-β1 adenovirus vector results in pulmonary fibrosis, but in Smad3 knockout mice there is resistance to development of fibrosis associated with a failure to activate CTGF gene expression . Furthermore, we recently found that Simvastatin, an HMG-CoA reductase inhibitor with described antifibrotic properties, also inhibits CTGF expression in isolated IPF patient-derived lung fibroblasts (K Watts, E Parker, MA Spiteri, JT Allen, unpublished data, 2001). The emergence of altered fibroblast phenotypes during tissue remodelling is well recognised. Myofibroblasts, differentiated fibroblasts with morphological features of smooth muscle cells, are a feature of fibrotic lesions and comprise the main cell type of the fibroblast foci already described . Functionally they seem to be involved in ECM production and the process of tissue contraction, necessary for wound healing. Fibroblasts isolated from IPF patients are characteristically more myofibroblast like than those from normal subjects, as determined from α-smooth muscle actin expression . 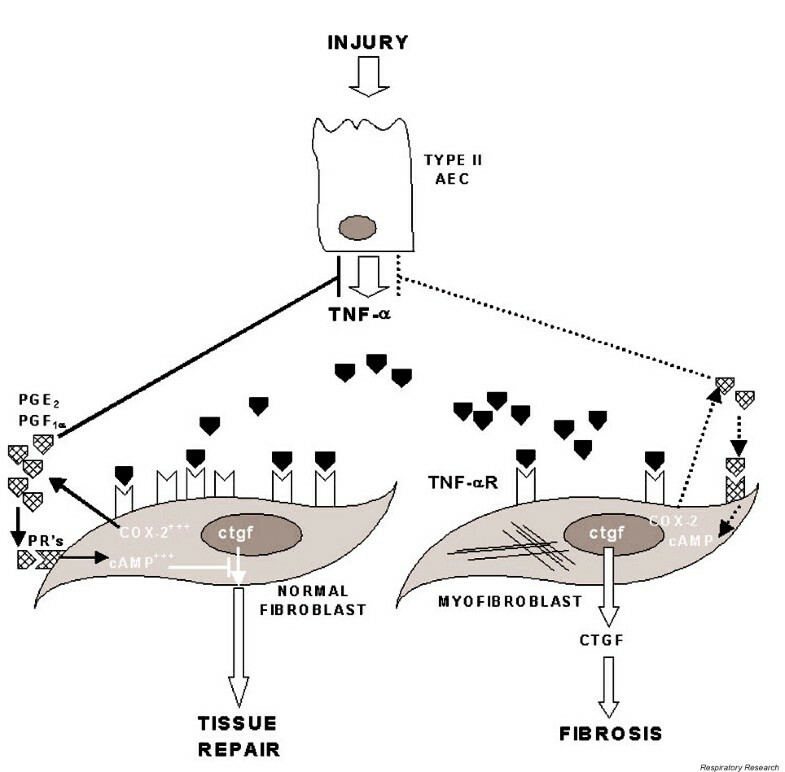 Recent data from a co-culture model of wound healing indicates that TGF-β1 induces, whereas IL-1β inhibits, fibroblast differentiation into a myofibroblast phenotype following epithelial cell injury. Activators of TGF-β1, such as fibroblast-derived thrombospondin-1, are necessary to convert latent TGF-β1 into its active form at the fibroblast surface to facilitate this differentiation . The myofibroblasts show abnormal responses to, or release of, growth factors, other mediators and ECM proteins (including enhanced collagen, TGF-β1, matrix metalloproteinase-9 and tissue inhibitor of metalloproteinase expression), giving them a profibrotic secretory phenotype . A consequence of the sustained presence of TGF-β1 is an inhibition of (IL-1β-induced) myofibroblast apoptosis. This inhibition prevents the necessary rapid clearance of these cells by apoptosis that is required for normal cessation of repair, and results in continued, deleterious ECM production . Other growth factors with apoptosis-modulating properties could also be involved; in particular CTGF, which acts downstream of TGF-β. Using CTGF antisense oligonucleotides to inhibit CTGF-mediated actions on apoptosis, we found a contrast between CTGF-induced apoptosis of primary bronchial epithelial cells and CTGF-inhibited apoptosis of primary IPF-derived lung myofibroblasts (JT Allen, unpublished data, 2001). These data suggest that CTGF could contribute to the persistence of myofibroblasts in the fibrotic lung, but whether CTGF can directly induce a myofibroblast phenotype itself is as yet unknown. Interestingly, an IPF-derived primary myofibroblast-like cell line demonstrates enhanced responsiveness to TGF-β1, compared with normal fibroblasts. This results in enhanced expression of both IGF-1 and CTGF, perhaps involving a fibroblast subpopulation overexpressing TGF-β type I and type II receptors  (JT Allen, K Watts, unpublished data, 2001). IGF-1 inhibition of apoptosis is well recognised and its increased expression in these cells may therefore contribute to the putative inhibition of myofi-broblast apoptosis. Finally, myofibroblasts from IPF also appear to be deficient in their production of eicosanoid autocrine inhibitors of proliferation and ECM deposition, apparently through their inability to upregulate cyclooxygenase-2  and TNF-α receptor , necessary for enhanced prostaglandin E2 (PGE2) synthesis. Both TNF-α  and PGE2  have been shown to reduce expression of CTGF, providing an endogenous mechanism for terminating the CTGF response to TGF-β1 and resulting in resolution of the fibroproliferative response without progression to fibrosis (Fig. 2). Downregulation of myofibroblasts by induction of apoptosis (e.g. using Simvastatin) or by inhibiting their differentiation (e.g. using IFN-γ) have thus been suggested as potential novel therapeutic approaches . However, in reducing myofibroblast proliferation, care needs to be taken to avoid a parallel reduction in AEC proliferation, which would inhibit re-epithelialisation. In this regard, data for CTGF antisense is encouraging (see earlier in this section), showing both a reduction of epithelial apoptosis and an enhancement of fibroblast apoptosis. Taken together, these data support the development of CTGF-targeted therapies for IPF. Failure of endogenous regulation of wound-healing in idiopathic pulmonary fibrosis (IPF). 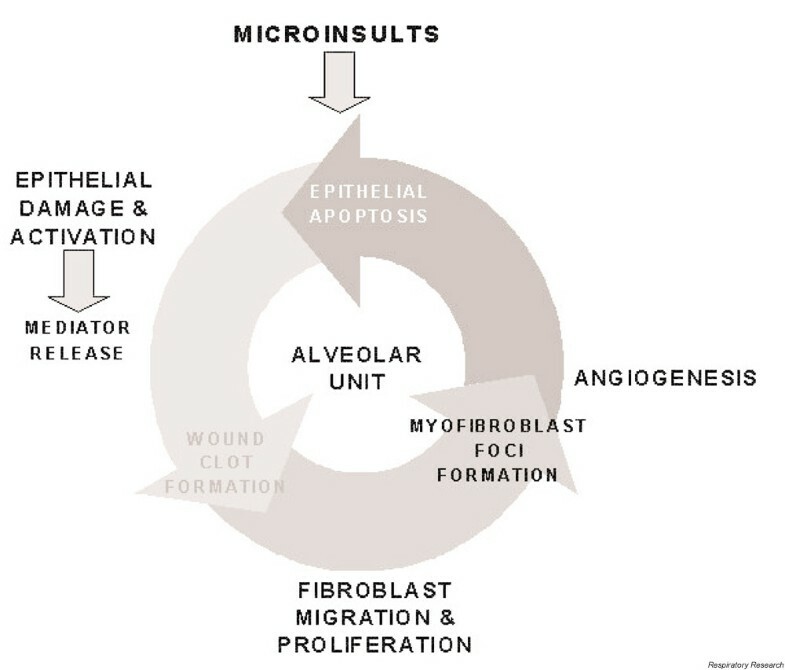 Injuries to alveolar epithelial cells (AECs) result in upregulation of growth factor production, including tumour necrosis factor-alpha (TNF-α). Binding of TNF-α to TNF-α receptor (TNF-αR) activates the cyclooxygenase-2 (COX-2) pathway and induces synthesis of prostaglandins including prostaglandin E2 (PGE2) and 6-keto-prostaglandin F1α (PGF1α). Prostaglandins exert negative feedback control of AEC TNF-α expression and autocrine inhibition, through raised intracellular cAMP levels, of the connective tissue growth factor (CTGF) response to transforming growth factor-β. This results in limited and healthy wound healing, and prevents further progression to fibrosis. In IPF, however, myofibroblasts exhibit marked deficiencies in TNF-α receptor expression and COX-2 induction that result in reduced synthesis of prostaglandins, and a failure in the normal self-limiting wound-healing response (broken arrows), ultimately leading to fibrosis. PRs, prostaglandin receptors. Timely re-epithelialisation following lung injury is crucial to the successful outcome of the wound-healing process, and recent evidence suggests that dysregulation of apoptosis may occur, perhaps involving the Fas pathway. Fibrogenic growth factors such as TNF-α and TGF-β upregulate pro-apoptotic co-factors (e.g. p53, p21(Waf1/Cip1/Sid1) and bax) required for Fas-dependent cell death, and these are enhanced in hyperplastic AECs from IPF . TGF-β1 also induces lung epithelial cell apoptosis through receptor-activated Smad signalling . Although there is some evidence that early loss of epithelial cells can occur by Fas-mediated apoptosis, it is unclear from studies in an animal model of bleomycin-induced pulmonary fibrosis and IPF  whether this is a prerequisite for the development of fibrosis . In a series of studies, Uhal and colleagues revealed that, in IPF fibrotic lesions, AECs exhibit enhanced apoptosis. It also seems that adjacent myofibroblasts release apoptotic peptides, angiotensinogen and its derivative, the fibroblast mitogen angiotensin II, that can induce this AEC apoptosis through angiotensin II receptor activation pathways . As might be expected, approaches that try to enhance AEC proliferation and thus promote repair have been advocated as possible novel therapies for IPF. Inhibitors of apoptosis-effector caspases can effectively prevent epithelial cell apoptosis and fibrosis in the murine bleomycin model . Captopril, an angiotensin-converting enzyme inhibitor, has the useful in vitro properties of inhibiting Fas-mediated epithelial cell apoptosis and inducing fibroblast apoptosis, and is currently undergoing clinical trials in Mexico. However, preliminary results do not show any additional improvement over combination therapy with inhaled steroid and colchicine . Keratinocyte growth factor, a mitogen and differentiation growth factor for type II AECs, has been found to have a protective effect against development of fibrosis in animal models of bleomycin-induced pulmonary fibrosis, where it downregulates TGF-β and PDGF-BB expression . Similarly, hepatocyte growth factor stimulates proliferation, migration and fibrinolytic capacity in A549 AECs and attenuates collagen deposition in a murine bleomycin-induced pulmonary fibrosis model. Of note, the antifibrotic effects of hepatocyte growth factor were maintained even when administered after development of the fibrosis . Neovascularisation in the lungs of IPF patients was first identified by morphological examination, but there have been few studies to characterise its role in the fibrogenic process. Vessel formation requires endothelial cell migration, proliferation and degradation of ECM, thought to be regulated by a number of growth factors, and its initiation is dependent on the balance between angiogenic and angiostatic factors. Members of the CXC chemokine family can exert opposing effects on angiogenesis due to the presence or absence of three amino acids (Glu-Leu-Arg; the ELR motif). IL-8 (containing the ELR motif) is thus angiogenic, while interferon-inducing protein-10 (IP-10) (lacking the ELR motif) is angiostatic. Levels of IL-8 are increased and those of IP-10 decreased in IPF samples compared with controls, favouring net angiogenesis. Furthermore, depletion of IL-8 or IP-10 from IPF fibroblast-conditioned media decreases or increases angiogenesis, respectively , and IP-10 administered to mice reduces the fibrotic response to bleomycin, through regulation of angiogenesis . VEGF is an established, essential, angiogenic factor. In a rat model of bleomycin-induced pulmonary fibrosis, increased numbers of VEGF-positive type II AECs and myofibroblasts were identified localised in fibrotic lesions . Recent data have shown that VEGF induces expression of CTGF, apparently through TGF-β-independent pathways, which is mediated through VEGF receptors Flt1 and KDR/Flk1 . CTGF itself is angiogenic, inducing endothelial chemotaxis and proliferation and neovascularisation in vivo, mediated via binding to integrin αvβ3 . Furthermore, CTGF antisense inhibits both proliferation and migration of vascular endothelial cells in vitro . It is as yet unclear whether CTGF contributes to the observed neovascularisation in IPF, and whether VEGF regulation of CTGF provides an alternative pathway for CTGF overexpression in IPF lungs. Considerable progress has been made in recent years towards our understanding of the pathogenesis of IPF. The critical role of a number of interacting growth factors in the initiation and maintenance of fibrogenesis has been highlighted. However, clinical progress to an effective therapy for IPF has not been achieved, in spite of promising results from novel antifibrotic therapies in animal models. This suggests that more targeted approaches must be developed, while at the same time more caution should be exerted in extrapolating data from animal studies to human IPF. The key must lie in dissecting the crucial, intricate molecular mechanisms that control fibrogenesis. Recent findings point to possible genetic predisposition and the interactions of a limited number of key growth factors with pathways regulating processes such as apoptosis in AECs and myofibroblasts. Since it appears probable that only a few of these pathways are crucial in IPF, precise targeting of any one of these pathways, via single or several growth factors, could yield potential benefits (Fig. 3). By directing future studies toward dissecting the regulatory pathways of growth factor expression in these cells, we can thus develop subtle approaches for targeting the processes they control and therefore attempt to halt the downward clinical progression of human IPF. Potential growth factor-mediated antifibrotic strategies. A universal cell (fibroblast, epithelial cell or inflammatory cell) is depicted with growth factor-processing pathways highlighted (solid arrows). Growth factors may exert autocrine and/or paracrine effects. In idiopathic pulmonary fibrosis, growth factor functions may be diminished or enhanced and reversing these effects could offer potential therapeutic benefits. 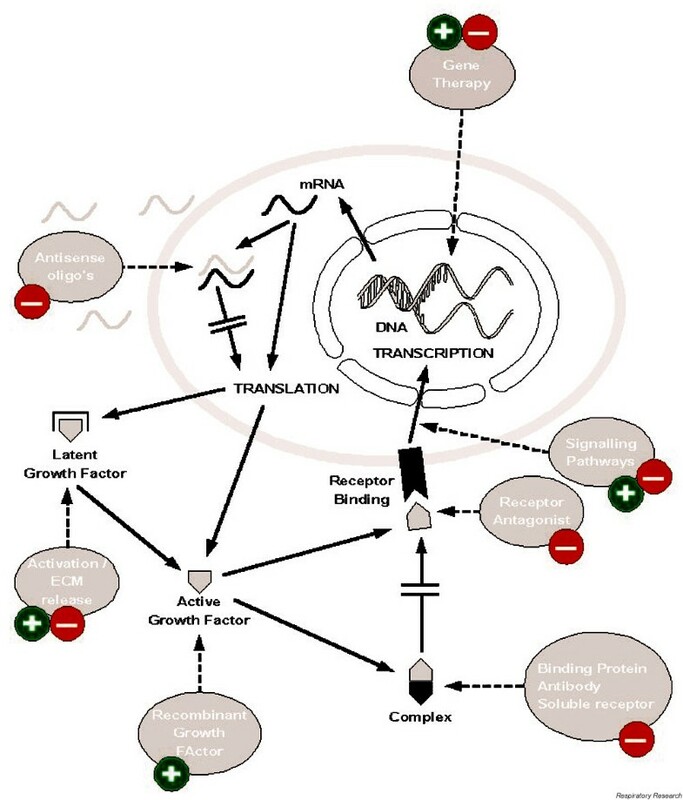 Various growth factor-specific strategies are depicted (broken arrows) that could be selected to either enhance (+) or inhibit (-) the chosen growth factor function. ECM, extracellular matrix.